Defending champion Gotta Love It 7, skippered by Seve Jarvin and crewed by for’ard hand Sam Newton and sheet hand Scott Babbage, had to come back from a seemingly hopeless position to win Race 1 of the 2012 Giltinan 18ft Skiff Championship on Sydney Harbour today. Gotta Love It 7 was more than two minutes behind the leader Mojo Wine (Archie Massey, Dan Wilsdon and Mike McKensey) midway through the race but excelled in the light South-East breeze to defeat Mojo Wine by 1m9s, with Rag & Famish Hotel (Jack Macartney, Peter Harris and Mark Kennedy) a further 37s back in third place. Appliancesonline.com.au (Micah Lane) finished fourth ahead of De’Longhi-Rabbitohs (Simon Nearn) and Pure Blonde (Tom Clout). US champion Howie Hamlin (CST Composites) was first of the internationals with a seventh placing. The race to the first windward mark was tight and traffic at the buoy was chaotic as nearly half the fleet approached with 15 secs. Rag & Famish Hotel led narrowly from Mojo Wine, with a large group headed by The Kitchen Maker (Cameron McDonals), Kenwood-Rabbitohs, De’Longhi-Rabbitohs, appliancesonline.com.au and New Zealand’s Yamaha (David McDiarmid) close behind. Mojo took a narrow lead over The Rag at the end of the long spinnaker run, while appliancesonline.com.au moved up to third ahead of The Kitchen Maker. 7, Thurlow Fisher Lawyers (Michael Coxon), Yamaha, De’Longhi-Rabbitohs and CST Composites. The three leading positions were unchanged on the beat back to Clarke Island where Mojo had increased her lead to more than one minute. 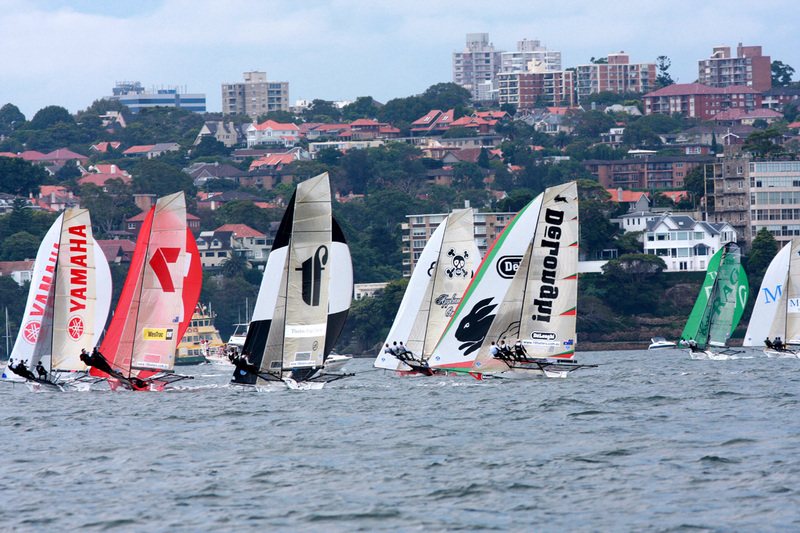 At Chowder Bay this margin has gone out to around 1½ minutes, but a major change was about to come over the race. Mojo Wine went to the right while 7 elected to go left on the work across the harbor into Rose Bay. When the three leaders set spinnakers for the run back across the harbour to Taylor Bay they were less than 30s. apart. This was reduced to only 15s. at Taylor Bay and it was obvious that Gotta Love It 7 was going to be hard to hold out as the breeze became lighter. The champion crew on 7 showed why they are so hard to beat when they went away over the next three legs of the course for an outstanding victory. Two of the more favoured teams, Yandoo and Thurlow Fisher Lawyers had poor results by their standards with 14th and 9th placings respectively. Gear failure forced Yandoo to miss the start then a breakage on Thurlow Fisher led to her capsize on the spinnaker run from Clarke Island to Chowder Bay.